Birger Schäfermeier started trading stocks when he was 14 years old. Today he is not only a successful trader, but he is also a portfolio manager at an asset management company. During trading fairs he has no problem trading live in front of an audience. Available (for free) from Birger Schäfermeier in the NanoTrader trading platform. 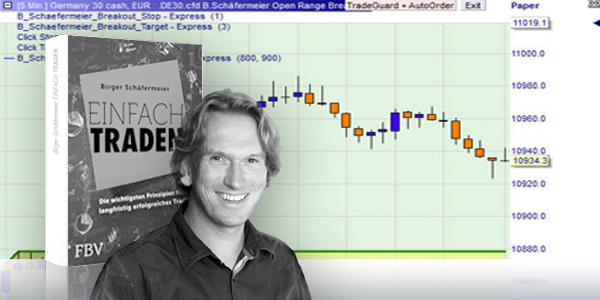 Birger Schäfermeier makes two of his trading strategies available in the NanoTrader Full trading platform: Return to Open and Open Range Break-out. Both trading strategies have been integrated in the NanoTrader trading platform. They can be used on the Dax, the Bund, the S&P 500 and the EUR/USD. Return To Open is one of two strategies in Birger Schäfermeier’s Morning Strategies package. The strategy is based on the principle that the market price, after a first move, will more often than not return to the open price. Birger uses the strategy to trade the Dax and the Eurostoxx in the morning and to trade the S&P 500 in the afternoon. The orders are placed at 8h00 (15h30 for the S&P 500). Before placing orders the strategy determines the market trend. To determine the market trend the strategy uses the SuperTrend indicator. If the trend is bullish, the chart background is green. If the trend is bearish, the chart background is red. This example shows the Dax in a negative trend (red chart background). Birger Schäfermeier placed a short sell limit order on the red line at 8h00. At 8h25 his position was opened. As Birger expected, the market price subsequently returned to the open price. Download a free trading platform demo. Open Range Break-out is one of two strategies in Birger Schäfermeier’s Morning Strategies package. The strategy analyses the price levels an instrument reaches in the first market hour. These levels are used as entry levels for a potential trade. Birger uses the strategy to trade the Dax, the Eurostoxx and the Bund in the morning and to trade the S&P 500 in the afternoon. This example shows (1) the open price, (2) the dark coloured zone which represents the first 60 minutes and (3) the high and low price levels on which Birger Schäfermeier may place an order at 9h00. The Dax index is in a negative trend (red chart background). In this case Birger Schäfermeier is likely to place a short sell stop order on the red line. In this German language interview the traders responds to several personal questions. Explore a trading platform made by traders for traders... test the free NanoTrader demo.